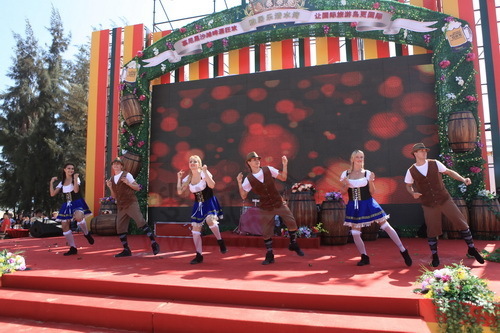 On Feb.5, Munich Beach Beer Carnival kicked off at Qingshui Bay, Lingshui County of Hainan Province, and will run for 20 days before wrapping up on Feb.24. The carnival gathers 6 famous beer brands from Germany including Lowenfort, Monchshof, Hofbrau Munche, Krombacher, Becker's and Paulaner. During the festival, many exotic performances from Germany's Oktoberfest will be staged, such as the Munich clown and magic show, traditional German band music and beer girls’ hot dances. Besides, a series of Chinese New Year celebrations will be held including a Beach New Year celebration film festival, a Spring Festival Gala on the beach, a New Year’s countdown party, a fireworks display and a Lantern Festival Party. The event is Hainan's biggest international tourist event of 2013, and millions of visitors are expected to flock there to attend.